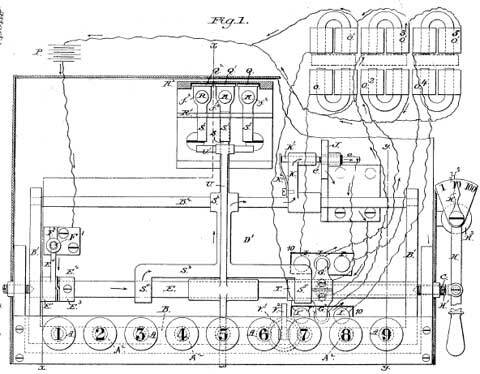 On August 31, 1886, Charles W. Weiss of Brooklyn, New York, received a patent (U.S. patent №348437) for an Electro Magnetic Adding Machine. Weiss acted as an assignor to the Kruse Check & Adding Machine Company in New York, a manufacturer of check machines, which was also interested in cash registers. Besides the patent, we don't have any information about the single-column adding machine of Weiss. It was one of the first adding device with electromagnetic operation, after the machine of Charles Pidgin and Francis Leonard from 1883. The gear wheels are moved by means of an electromagnetic mechanism, powered by batteries. By pressing of a key, is closed particular contact and in this way is formed an electromagnet, which is rotating a lever, connected with the gear-wheels. The angle of rotation of the lever depends on the location of the contacts.